Parasailing in Oahu offers a safe, thrilling way to see the beauty of Hawaii from a whole new angle! No experience is required, and safety is the top priority, so beginners and experienced adventurers alike are welcome! 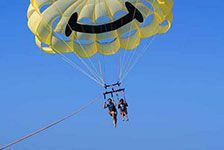 Choose from the thrilling Oahu parasailing adventures listed below.